Once in a while, I notice a study that makes no logical sense. 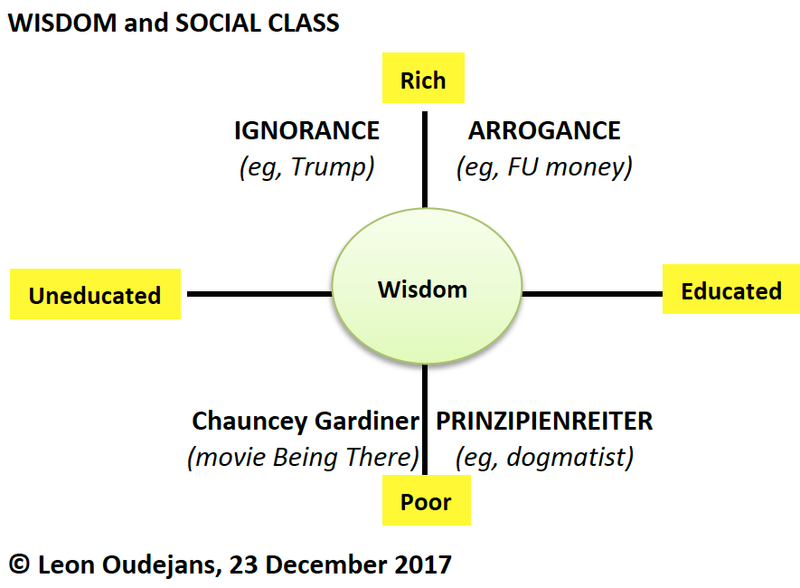 On 20 December 2017, Justin P. Brienza and Igor Grossmann published their study on "Social class and wise reasoning about interpersonal conflicts across regions, persons and situations". Science Magazine referred to this study by using this heading: "The lower your social class, the ‘wiser’ you are". In order to understand its conclusion, I made a diagram. I used rich vs poor to express social class. I used educated vs uneducated to express knowledge. According to this study, Wisdom would then be found in the lower-left corner. The only example that fits this box is Chauncey Gardiner, the main character from the 1979 movie Being There (IMDb). The upper-left and upper-right corners were relatively easy to fill. Its extreme versions are often labelled as ignorance and arrogance. Initially, the lower-right corner was hard. Ultimately, I decided on the extreme version of the Prinzipienreiter, a German word for a dogmatist. For some, principles are a substitute for a rich person's pragmatism (and opportunism). It would be incorrect to use "human stupidity" in the lower-left corner. 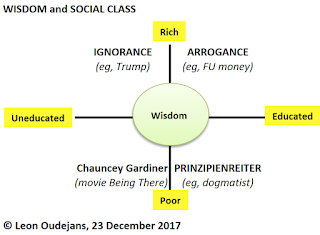 If Wisdom is the inner circle then human stupidity is the outer circle - in all 4 corners. To some extent, the lower-left corner might - perhaps - be labelled as "street wise" or "street smart". Also see Wikipedia. 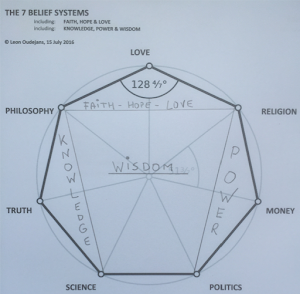 Wisdom is also at the heart of my concept of the 7 Belief systems, and of its 3 domains: Love, Knowledge and Power. Strong - and certainly extreme - beliefs have a nature of overriding Wisdom. The Knowledge and Power domain have a habit of creating a balance (ie, Knowledge = Power). Such a balance in life should enable finding Wisdom. Socrates claimed that "the only true wisdom is in knowing you know nothing". Albert Einstein came to a similar conclusion: “A true genius admits that he/she knows nothing.” Wisdom in the words of Confucius: "By three methods we may learn wisdom: First, by reflection, which is noblest; Second, by imitation, which is easiest; and third by experience, which is the bitterest." Asking for 3rd party advice (a lead indicator in this study) indeed makes good (wise) sense, especially when you are confronted with a dilemma. Finding independent, impartial, and solid advice isn't that easy. Hence, any 3rd party advice must first be filtered from bias. It's not what you look at that matters, it's what you see. A quote by Henry David Thoreau.